Gaiazova has improved her sprinting compared to 4-5 years ago, but didn’t see much improvement over last year, although her best result was slightly better. Crawford has been fairly inconsistent from year to year, including a season lost to injury, and her best seasons are now 3 and 5 years in the past. It was neat to see a third Canadian able to advance past the quarterfinals, but it’s not clear from Jones’s trend whether that will prove to be an anomaly or not. ‘Other’ refers to American women other than Kikkan Randall. Randall’s median performance slipped a bit back in 2009 thanks to a few more sub-par races than usual, but she’s turned things around dramatically since then. Some people have noted that both of the folks who finished above her in the sprint World Cup points (Follis and Majdic) are retiring next year. However, we should also note that Marit Bjørgen was only 24 WC points behind Randall and did two fewer sprint races this season. With Bjørgen likely to do the Tour de Ski next year, and with the sprint races evenly split between classic and freestyle, I think Bjørgen’s a safe bet for an overall sprint podium. The next closest women to Randall were Kowalczyk (113 points back) and Falla (122 points back). Kowalczyk did 10 races, the same as Randall, but Falla only did 8. I’m betting that in order to repeat her overall sprint podium next year, Randall will have to outpace one of those three: Bjørgen, Kowalczyk or Falla. (And of course there’s always the unpredictable newcomer.) But to do that, Randall will surely have to raise the level of her classic sprinting, as all three of those ladies had much more balanced results between techniques this year and the schedule will be evenly split 6C/6F next year, not 5C/7F. Getting back to the graph above, it’s clear that Randall’s sprinting success hasn’t really filtered down enough to show up in WC results, at least not yet. Along with quite a few others, I was excited by Ida Sargent’s early season racing this year, but an unfortunate car accident seemed to gum up the works. On the one hand, I’m optimistic that Sargent might have some success if she earns some WC starts next year, particularly in classic sprints. On the other hand, I’m following the classic sprint stage of the Sun Valley SuperTour final as I’m writing this, and while Sargent was the closest American to Randall in qualifying by a hefty margin, she was still slightly more than 4 seconds back. Sargent beat Randall in qualifying in her one classic WC sprint (in 33rd), but when Randall has qualified, 4 seconds generally would push her Sargent of the top 30. This is all pretty negative for what was easily the best season by a US skier in recent history, and probably the best since the days of Bill Koch and Co. So let’s end on that reminder of what a fun season it was! Posted by Joran on Wednesday, April 27, 2011, at 6:00 am. Filed under Analysis, Cross Country. 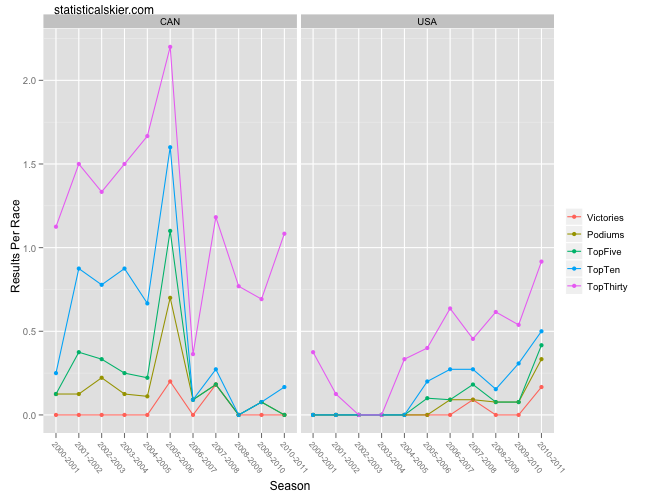 Tagged canada, kikkan randall, recap, season review, Sprint, USA, women. Follow any responses to this post with its comments RSS feed. You can post a comment or trackback from your blog.